They call it pulling the trigger. Not by a killer in the night, but by a judge on the bench. As the execution date nears, the conscience-wracked judge confesses his unease to former homicide detective Harlan Donnally on a riverbank in far Northern California. And after immersing himself in the Norteno and Sureno gang wars that left trails of bullets and blood crisscrossing the state and in the betrayals of both cops and crooks alike, Donnally is forced to question not only whether the penalty was undeserved, but the conviction itself. Soon those doubts and questions double back, for in the aging judge's panic, in his lapses of memory and in his confusions, Donnally begins to wonder whether he's chasing facts of the case or just phantoms of a failing mind. But there's no turning back, for the edge of night is fast closing in on Dominguez, on McMullin, and on Donnally himself. 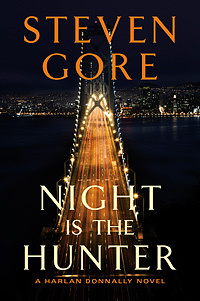 "Gore not only puts a face on the difficulties of serving justice but also illustrates their immensity."